Theresa May faces calls from several parties to be included if she decides to hold a TV debate on her Brexit deal. Labour said Jeremy Corbyn would "relish" going head-to-head with the PM, in response to reports she wanted to challenge him to a TV showdown. Meanwhile, Conservative MP Bernard Jenkin said a Brexiteer must be on the panel. No 10 has declined to comment. A spokesman told reporters the prime minister "debates the leaders of the opposition parties regularly on Brexit" and was doing so again in the House of Commons on Monday afternoon. However, he did not deny the option was being considered. A Labour Party spokesman responded to the report in Monday's Daily Telegraph by saying: "Jeremy would relish a head-to-head debate with Theresa May about her botched Brexit deal and the future of the country." Scottish National Party leader Nicola Sturgeon had been quick to respond to suggestions Mrs May was considering challenging Mr Corbyn to a debate ahead of the Commons vote on the deal, asking "how about it?" 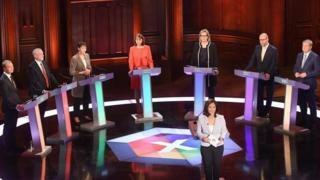 And Plaid Cymru echoed the SNP's views that the leaders of the two main parties could not represent the British public as a whole: "It can hardly be much of a debate when both of them are committed to Brexit." Liberal Democrat leader Sir Vince Cable demanded to be involved, pointing out that neither the Tories nor Labour had called for another Brexit referendum. And Green Party MP Caroline Lucas, who is also pushing for a new referendum, said any debate "must be cross-party, featuring a diverse range of voices representing every nation, as well as every stance on this deal and our relationship with the EU". Senior Conservative MP Bernard Jenkin told the BBC's Politics Live Brexiteers would have to be represented. Referring to the respective party leaders' stances before the 2016 In-Out referendum, he said: "Corbyn was for Remain, Theresa May was for Remain. The 52% who voted Leave have got to be represented in those debates." Faced with strong opposition from both Leave and Remain supporters in the Commons, including from many in her own party, the prime minister is focused on convincing the public her deal is "for the good of our United Kingdom". In a "letter to the nation" she set out why she would fight "heart and soul" for her vision of Brexit, and in recent weeks has responded directly to the public via the BBC News Channel, Radio 5 live and LBC radio. The apparent appetite from Downing Street for Theresa May to go head-to-head with Jeremy Corbyn is a turnaround from last year when she declined to to take part TV debates during the general election campaign.